The Gwinnett County housing market is booming! You’re renting in Gwinnett County? Might as well throw your money out the window. Don’t know if now is the right time for you to purchase a home? Maybe you’re hesitant because you don’t know how the process works. Here’s your chance to learn everything you need to know about the home buying process from Professionals in the Real Estate and Mortgage industry…..FREE! RSVP at the bottom of the page! 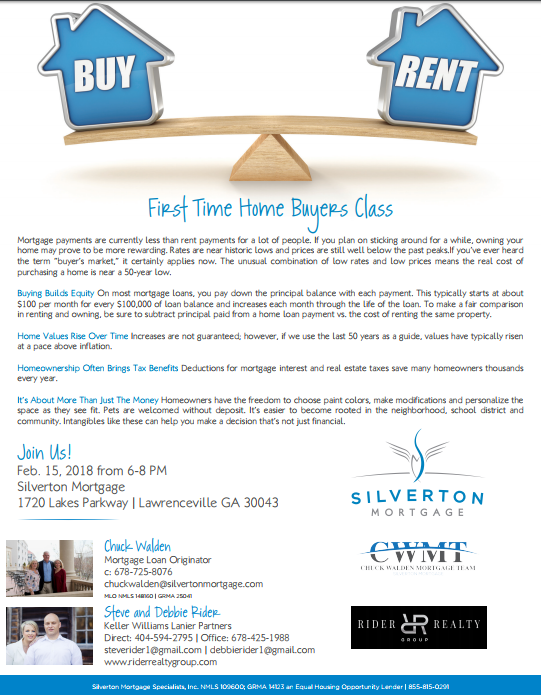 Come join us Feb 15th 6-8pm at Silverton Mortgage 1720 Lakes Parkway Lawrenceville Ga 30043 to learn more about the process of buying a home from some of the best pros in the area. You can even get pre-approved for a mortgage on the spot!